I recently acquired a Berge knife with French hallmarks. 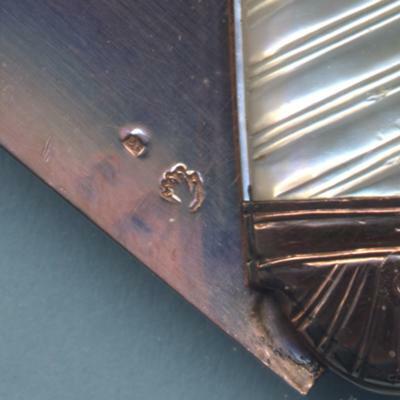 I will attempt to upload pictures of the hallmarks, the knife, and a page from Tardy on International Hallmarks which I believe shows one of the marks on the knife. The other hallmark under magnification says "ET". I understand that is a remark which says the knife is foreign (to France) and that the red gold blade is less than 9 kt. 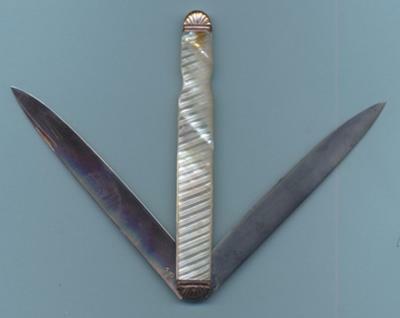 My questions are: Why does the knife have a French hallmark from the 1762-68 period if it is foreign to France? Tardy identifies the "handprint" mark as a countermark. What does that mean? What is a "remark"? And when was that likely placed on the knife relative to the handprint hallmark? Is it correct that the ET mark means the gold blade is less than 9 kt? Does it appear that this knife is a fake, or real? Here's a picture of the entire knife. I had to downsize it.